About one hundred years ago, architects attempted to rely on ‘honesty of expression’ in architectural forms. It concerned everything, including things external to architecture. The attempt did not produce convincing results. The initial postulates proved to be false. Architecture becomes estranged from the ‘external’ objectivistic determination: it is the source of meanings and emotions in itself. It also means acceptance of theatricalization as a basic strategy of architectural activity, whatever forms and techniques are used. This strategy has a centuries-long history and includes several varieties, which are differentiated in the article. Azizyan, I. A., Dobritsyna, I. A., & Lebedeva, G. S. (2002). Teoriya kompositsii kak poetika arkhitektury [The theory of composition as poetics of architecture]. Moscow: Progress-Traditsiya. Barthes, R. (1971). Semiologiya i gradostroitelstvo [Semiology and Urbanism]. Sovremennaya arkhitektura, 1. Baudrillard, J. Soblazn [Seduction]. Moscow: Ad Marginem. Boyer, C. (1996). The City of Collective Memory: Its Historical Imagery and Architectural Entertainments. MIT Press. Debor, G. (1999). Obshchestvo spektaklya [The society of the spectacle]. Moscow: Izdatelstvo “Logos”. Eco, U. (2003). Baudolino. Saint Petersburg: Symposium. Eco, U. (2006). Otkrytoe proizvedenie [The open work]. Saint Petersburg: Symposium. Evreinov, N. N. (1922). Teatralnye inventsii [Theatre inventions]. Moscow: Vremya. Foucault, M. (1977). Slova i veshchi [Words and things]. Moscow: Progress. Genisaretsky, O. I. (1996). Eshche raz o sredovom proektirovanii i proektnosti kultury [Again on environmental design and projectivity of culture]. Kentavr, 2. Glazychev, V. L., Egorov, M. M., Ilyina, T. V. et al. (1995). Gorodskaya sreda. Tekhnologiya razvitiya: Nastolnaya kniga [Urban environment. Technology of development: A manual]. Moscow: Ladya. Heidegger, M. (1999). Polozhenie ob osnovanii [The principle of reason]. (O. A. Koval, Trans.). Saint Petersburg: Lab. metafiz. issledovanii pri filos. fak. SPbGU: Aleteya. Kapustin, P.V. (2012). Design Thinking and Architectural Consciousness. Critical introduction to Ontology and Phenomenology of Architectural Designing (monograph). Saarbrucken, Germany: Lambert Academic Publishing. Kapustin, P. V. (2013). O meste vizionerstva v evolyutsii arkhitekturnogo proektirovaniya [On the place of visionariness in the evolution of architectural design]. Proceedings from the international research and methodological conference: Architectural interspace of the 21st century: experience, problems, prodpects. Saint Petersburg: Izd-vo SPbGASU. Kapustin, P. V. (2017). Sushchestvovalo li “arkhitekturnoe proektirovanie”? [Did “architectural design” really exist?]. In I. A. Dobritsyna (Ed. ), Voprosy teorii arkhitektury. Arkhitektura: sovremennyi opyt professionalnoi samorefleksii. Collection of research papers and reports at the Ninth and Tenth Ikonnikov’s Readings (pp. 75-87). Moscow: LENAND. Le Corbusier. (1971). Vlast’ pered litsom sovremennykh zadach (1935) [The power in the face of contemporary tasks (1935)]. Sovremennaya arkhitektura, 6. Lotman, Yu. M. (1996). Vnutri myslyashchikh mirov. Chelovek – tekst – semiosfera – istoriya [Inside the thinking worlds. Man – text – semiosphere - history]. Moscow: Yazyki russkoi kultury. Maeva, V. M. (1986). Mnogofunktsionalnost i scenografichnost gorodskoi sredy [Multifunctionality and scenographics of urban environment]. Collection of research papers. Moscow: TsNIIEP, 14-17. Mumford, L. (1937). What Is a City? Architectural record, 94–96. Pallasmaa, J. (2013). Myslyashchaya ruka: arkhitektura i ekzistentsialnaya mudrost bytiya [The thinking hand: existential and embodied wisdom in architecture]. Moscow: Klassika-XXI. Sanoff, H. (2015). Souchastvuyushchee proektirovanie: Praktiki obshchestvennogo uchastiya v formirovanii sredy bolshikh i malykh gorodov [Participative design. The practice of public participation in shaping the. environment of towns and cities]. Vologda: Proektnaya gruppa 8. Zinchenko, A. P. (1983). Simvolika “bezobraznogo i obydennogo” v arkhitekture SShA [Symbolics of “the ugly and the ordinary” in architecture of the USA]. Arkhitektura Zapada: Protivorechiya i poiski 60 – 70kh godov. Book 3. Moscow: Stroiizdat, 65-72. KAPUSTIN, Petr; LESNEVSKA, Rodislava. Strategies of Theatricalization in the Urban Interior. 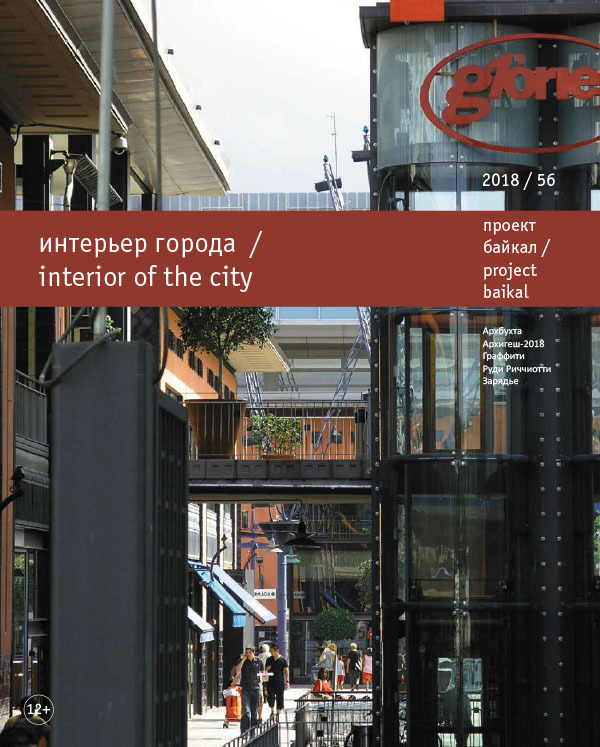 project baikal, Russian Federation, n. 56, p. 52-58, aug. 2018. ISSN 2309-3072. Available at: <http://projectbaikal.com/index.php/pb/article/view/1321>. Date accessed: 23 apr. 2019. doi: https://doi.org/10.7480/projectbaikal.56.1321.